Buffalo Stampede, The Preview Match to END of TRAIL! Wild Bunch Categories - Traditional, Ladies Traditional, Modern, Ladies Modern. 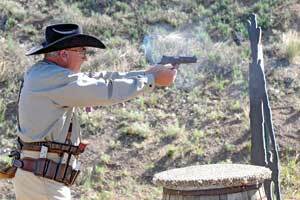 Cowboy Action Categories - All SASS Sanctioned shooting categories will be offered. Categories will only be honored at the match if the minimum number of entrants requirements are met. There are no minimums for Junior and Buckaroo categories. Mens category minimums are 7 entrants, ladies category miminums are 3 entrants. Camping is available for RV's and tents. No hook-ups, but chemical toilets are available. Camping is restricted to one RV or one tent and one car per site. Day parking for shooters is provided in a separate, adjacent area. Breakfast, lunch, and dinner is provided at reasonable cost from an excellent array of food vendors all five days. Outlaw Trail is a BYOB event. Dinner is available from vendors and you pay direct to vendors. No one is permitted to wear firearms where alcohol is present. This rule will be strictly enforced. Cart rental is $30.00 for the entire match. The corral will be open from 8:00 AM to 5:00 PM Wednesday through Saturday. Overnight storage of your cart (no guns) is also available. Golf Carts, ATV's, and single seat carts for the handicapped are permitted when proper state issued handicapped credentials are provided. You must check in your vehicle and get a Founders Ranch Permit authorizing you to use the vehicle at Founder Ranch. Golf Carts and ATVs, even with permits, are not permitted in town and my not be parked in town. They must be parked in the designated parking areas on the west side of town (near the bridge) or along the fence line (grassy area) on the range road. NO Carts or ATVs may be parked on the range road, in bays or the mouth of a bay, behind the vendor buildings, or in front or around the Copper Queen / Belle Union. SASS does not provide vehicles for the handicapped. Handicapped parking is provided for vehicles with proper handicapped identification placards and transportation between parking areas and the shooting range is provided. Powered gun carts are permitted as long as they are not drivable vehicles.